Thanks to recent approval by the Federal Aviation Administration, Middle Georgia State University's School of Aviation has its first permanent protective airspace box - a designated place in the sky where pilots in training can practice emergency maneuvers. "This is the first time we have had a permanent space," said Gene Behrends, assistant chief pilot for Middle Georgia State's School of Aviation, which is based on the Eastman Campus. "We've been conducting 'upset recovery' training in normal airspace up until this time, which is legal, but having a designated permanent box adds greatly to safety and improves the training." The protective airspace box - about four miles from the Eastman Campus - is about two miles long and one mile wide and ranges from 500 feet to 4,000 feet above the ground. When School of Aviation students and instructors taxi for takeoff, they inform the Eastman Campus tower controller that they are headed for "the box." He or she then contacts controllers in Atlanta and Jacksonville, who vector airplane traffic around School of Aviation students and instructors. "That increases safety for us because it's very hard to keep track of traffic when your airplane is rolling rapidly, or if you are going vertical," Behrends said. The School of Aviation's flight instruction includes teaching student pilots ‘spin training,’ 'upset recovery,' and aerobatic maneuvers such as loops and rolls - all aimed at honing their instincts to react quickly and effectively if something goes wrong while in flight. Students can also use the protective airspace box to earn 'tail wheel' endorsements, which means they've trained on aircraft with special landing gear. 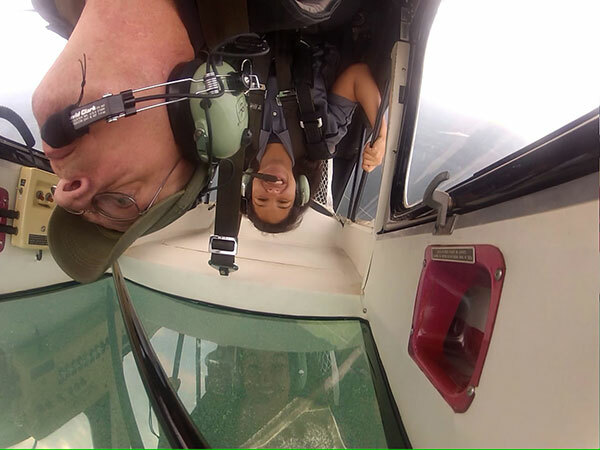 Image: An MGA aviation student, Marissa Burnette, and Gene Behrends, assistant chief pilot, are inverted during a loop while flight training.